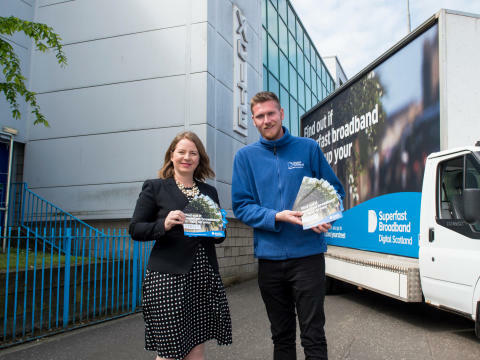 To help promote the fact that fibre broadband is widely available in West Lothian, the Digital Scotland Superfast Broadband team were out and about in Whitburn and Linlithgow this week to continue their ‘Up your Street’ campaign. More than 22,400 homes and businesses across West Lothian can now upgrade to faster fibre broadband through the £428 million Digital Scotland Superfast Broadband rollout. Local people need to sign up for the new, faster services with an internet service provider, as upgrades are not automatic. Across Scotland, more than 890,000 premises are able to connect to the new network thanks to the programme. Areas across West Lothian to benefit from the Digital Scotland rollout, led by the Scottish Government, include Westfield, Winchburgh and Whitburn. More local coverage will follow as engineers from Openreach – Scotland’s digital network business – continue work on the ground. Councillor Kirsteen Sullivan, Depute Leader of West Lothian Council, added: “I am delighted that areas across West Lothian can access fibre broadband thanks to the programme and more people are now able to get a superfast speed. Whether you are downloading a box set, a small business making transactions or just keeping in touch with friends, fibre broadband can make it all happen easily. “Many of these latest lines have been converted from a format once thought incompatible with high-speed fibre broadband, and we’re increasingly using ultrafast Fibre-to-the-Premises (FTTP) to deliver the network directly into some individual dwellings, in places like Stoneyburn and Livingston Station.